Polar Bears can be found in the northern areas of Canada, Alaska, Russia and Norway. They are also located in various parts of Greenland. Polar Bears are often located near areas of water and ice floes where their favorite food, seals, can be found. They have dens in which they will sleep and where the females give birth to cubs. Polar Bears do not enter true hibernation in the winter as this is a period of hunting, however, some polar bears, and pregnant females in particular, enter a deep sleep where their heart rates drop. Polar Bears' diets consist mainly of seals. They use a variety of tactics while hunting seals. These tactics usually involve stealth and patience. They occasionally feed on other animals, including walruses. Polar Bears also sometimes feed on the carcases of dead whales. Polar Bears are among the largest land mammals on earth. Males weigh between 700 - 1400 pounds and stand between 8 - 10 feet tall. Females are smaller than males, with weights averaging 350 - 700 pounds. Polar Bears appear to have a white coat; however, the hairs are actually translucent and clear. Their skin, under the fur, is black. The coat and skin are adapted to absorb sunlight and retain heat. Like many animals of the tundra, Polar Bears have short ears to minimize heat loss. Polar Bears will give birth one out of every two to three years. The mating season occurs in the spring, and the female will then give birth in the winter to a litter of one to two cubs. Polar Bears are listed as vulnerable because of the possibility of ice floes in the arctic region melting due to climate change. 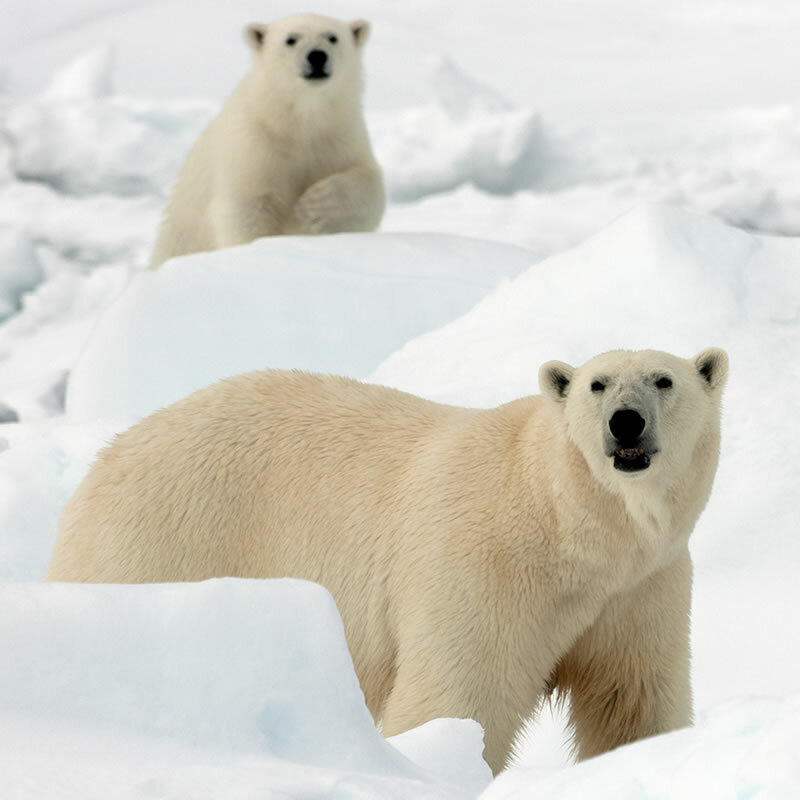 While the number of Polar Bears is still relatively healthy, human activity such as pollution and oil drilling could create habitat loss for the bear.